It's all going off for Untold right now, with a string of increasingly crucial twelves under his belt and a following that now includes not only the usual heads but also the likes of Modeselektor and Hardwax pushing his wares at every given opportunity. This latest plate for Hot Flush is possibly his most anticipated yet, with the massive "Just For You" barely contained on the a-side, while man of the moment Roska delivers a predictably righteous refix on the flip. The original carries considerable dancefloor punch with a low-swung ravey Garage vibe propelled at a healthy 140bpm with all those tight little shuffle edits Untold has become known for over the last 18 months. Basically - it's an absolute dancefloor slayer. 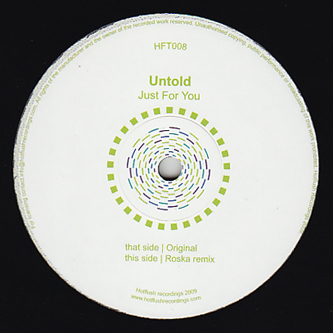 Roska, meanwhile, takes the tempo down a notch over on the flipside, with a signature UKF percussion line laying the foundations for another perfectly pitched and executed exercise in deep and deadly dancefloor glamour from probably the most talked about underground producer in the UK right now. Massive twelve - u know it.